When I was a kid I hated brussel sprouts, but as an adult, I realized they are mostly over cooked by people. When you cook them lightly so they still retain some of their bright green color, they are magnificent! If you don’t think you like them, give them another try. We planted some Brussel sprouts in the spring and it took forever for them to produce so we cut them down in the heat of the summer. 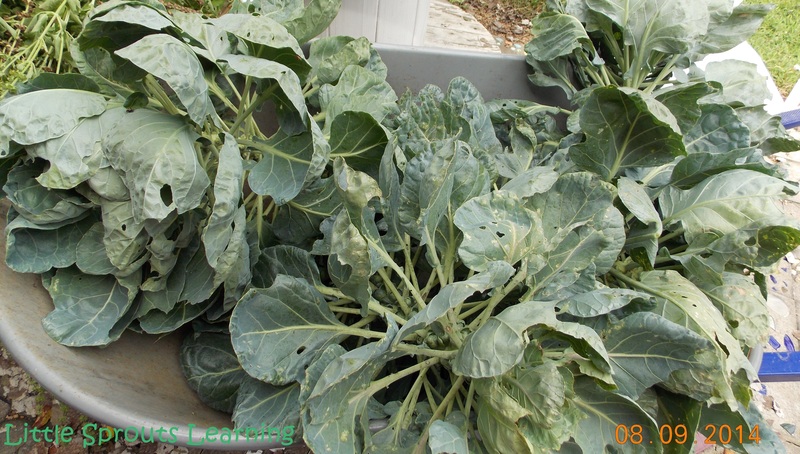 Any greens or cole crops such as kale, cabbage, broccoli or cauliflower can become bitter when harvested in the heat. 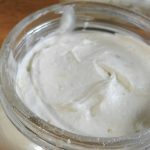 For my Brussels sprouts, a quick blanch was all it took to take the bitterness out of them. If your sprouts aren’t bitter, no need for that step. 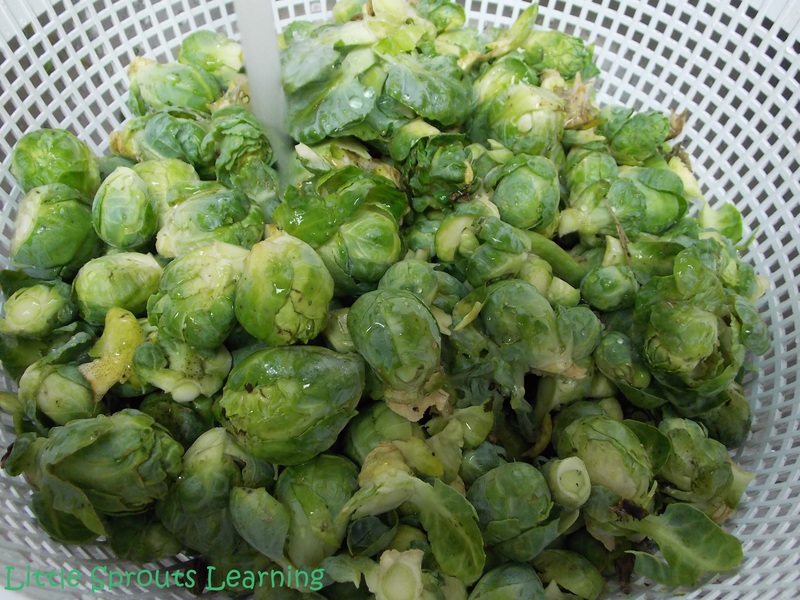 If you want to grow brussel sprouts from seed, you need to plant them around January or February in your seed flats. They are very small seeds, so they only need to be planted under a scant covering of soil. A good rule of thumb is plant seeds twice the depth of how big they are. That wouldn’t even be a quarter of an inch for brussel sprout. They just need a dusting. You’ll grow them under a grow light or in your green house until February or March and then plant them out. 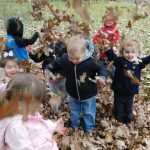 Our spring and fall seasons are super short in Oklahoma so growing them in the fall into the winter is the best way to get a good harvest. 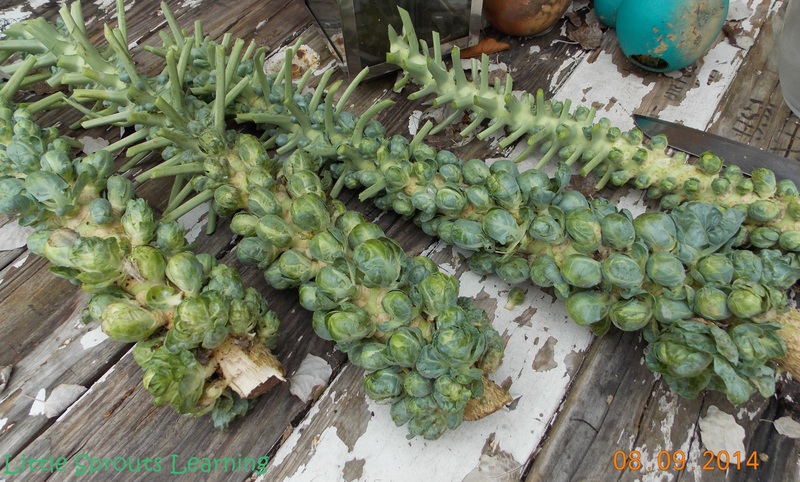 When planting your brussels sprouts, plant the seedlings about 1 foot apart. They don’t take up a lot of room in the garden, but they do need room to develop. You could do 18 inches apart if you have more room. 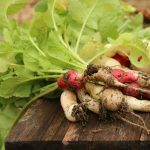 Plant them at the same soil level they were in the pots. We haven’t figured out the secret to growing seedlings, so we buy ours at the store. You know they sprouts are ready to harvest when they are about bouncy ball size. They are edible larger, but they tend to open up and are more like loose greens. 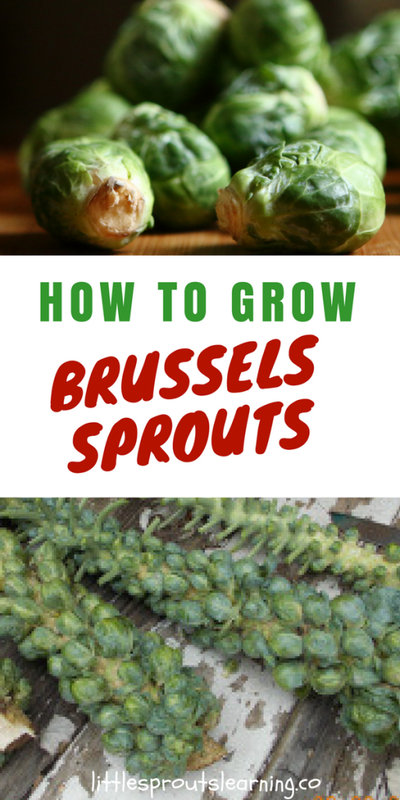 You can eat the brussel sprouts smaller, but letting them grow gives you more yield. Any stage of brussel sprouts have been delicious to us. Once you harvest the stalk of the brussels sprouts, you can remove the leaves and you’ll be able to get to the little bundles of yumminess. Use a sharp knife to cut them off the stalk. 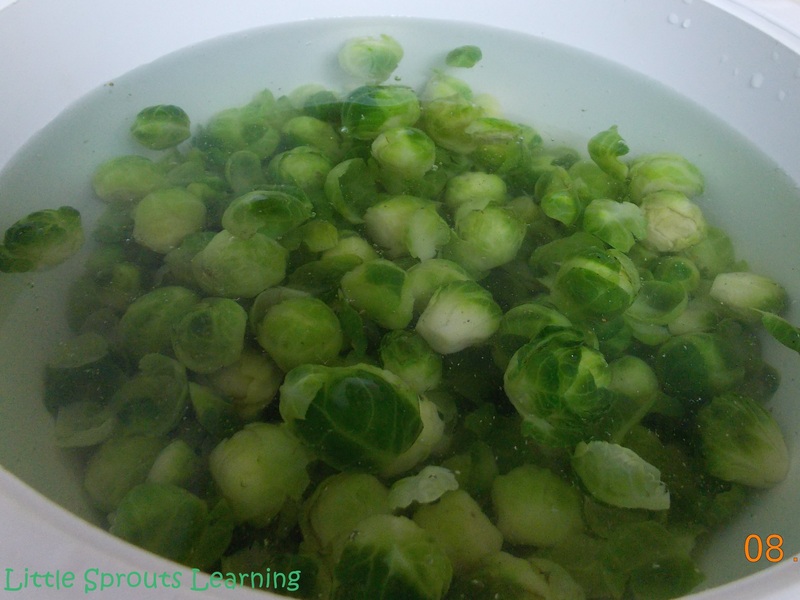 If your brussel sprouts are bitter, you can blanch them in boiling water for about 3 minutes and then plunge them into ice water to stop the cooking process. We love to cook our brussel sprouts in a bit of bacon fat. Cut a piece of bacon into small pieces and saute until browned. 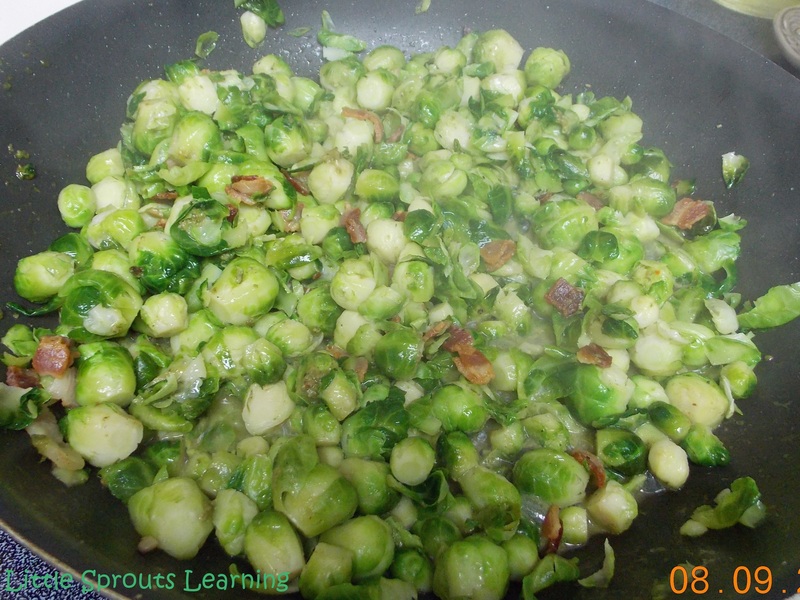 Toss in your brussel sprouts and saute them for about 2 minutes or until they are bright green and tender. Don’t overcook them. Yuck! Then salt and pepper to taste. 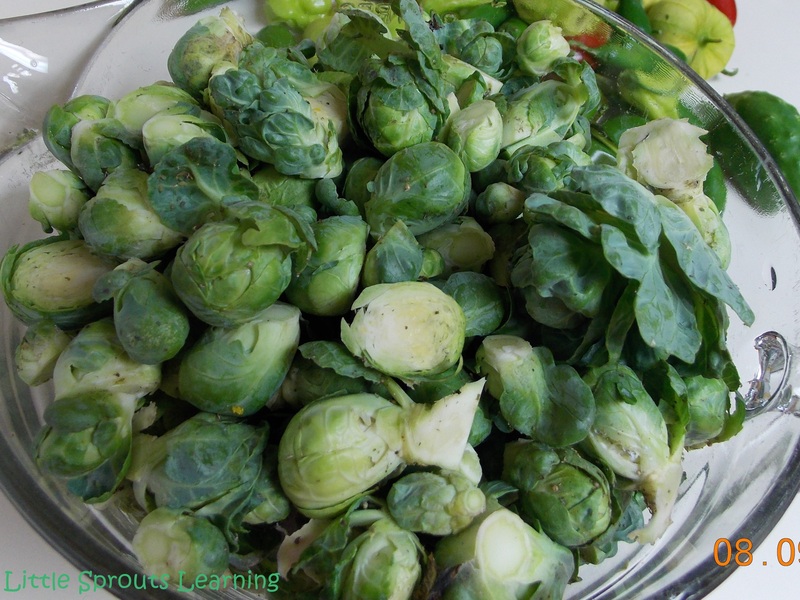 Brussels sprouts are delicious raw, boiled, sautéed, or roasted. I have never tried them any way I didn’t like them except for overcooked. 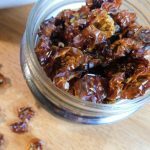 Even my picky eaters enjoy them with this bacon method. I cook a lot of vegetables with a piece of bacon for flavor because it helps picky kids take interest in them. But I cook them for my family and my kids without bacon and they still enjoy them. 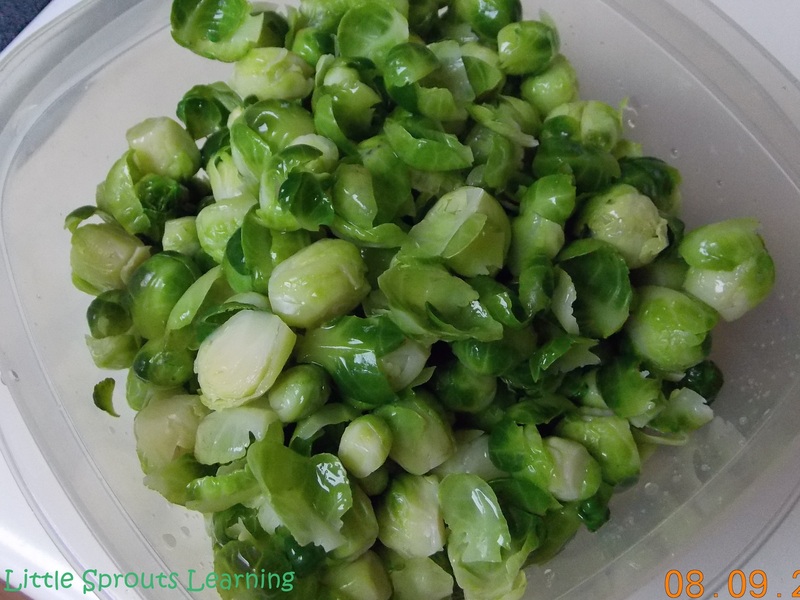 You can also toss the brussel sprouts in salt, pepper and olive oil and throw them in the oven on a baking sheet at 400 degrees until they are lightly brown on the edge. You can also grate some parmesan cheese over the top as they finish roasting. If you don’t like Brussels sprouts, try cooking fresh ones yourself and if you don’t overcook them, I’m willing to bet you will like them too. Wow! I never knew they grew like that! Me either, aren’t they adorable? Any time someone comes to the garden, I show them my Brussels sprouts and say, aren’t they cute? Tee hee hee. Have you ever pan fried them with blue cheese? They are great with gnocchi! MMMMM, no, I haven’t, but it sounds great! Thanks for the idea. It’s so divine you won’t believe it! I have some feta on hand, maybe I could try it with that this week? Could do. I think it’s worth a shot! But the blue cheese has such a distinctive taste it’s worth trying later as well. Good tip about blanching them. I didn’t know that!